The most powerful special interests in our state, and the legislators that do their bidding, hate that Floridians can directly amend our Constitution on Election Day. That’s why, right now, leaders in the Florida House and Senate are fast tracking Anti-Voter Initiative bills through the legislature that would make it even harder for citizens like you and me to participate in our democracy. Big special interest groups have already made Florida’s citizen-led amendment process the most difficult in the nation and now they want to make it practically impossible. Why? Because the $$ millions $$ they spend each year buying dominance over the Florida Legislature can be countered by the people themselves. When Floridians get fed up with status quo politics, they can go around the legislature and use direct democracy to pass a new constitutional amendment. The same legislative leadership that bends over backwards to appease big sugar, monopoly utilities, big developers and other special interests now want to squash the voters’ voice. 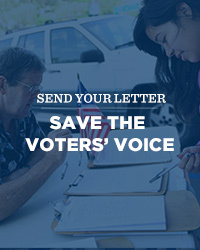 Urge your state representative and senator to oppose the Anti-Voter Initiative bills that make it harder for Floridians to participate in our democracy. Restoring the right to vote to 1.4 million people. Legalizing medical marijuana. Water and land conservation. Stopping partisan gerrymandering. Reducing classroom overcrowding. Much of the progress we’ve made in Florida is due to the citizen initiative process which is now in jeopardy. The right of citizens like you and me to participate in our democracy is our country's most-fundamental underlying value. These attacks have become a priority of legislative leaders and the big business lobbyists they answer to, so we need an overwhelming wave of grassroots opposition in order to stop this flagrant assault on the voters’ voice. Tell your state legislators to vote NO on the Anti-Voter Initiative bills. These legislative proposals represent a blatant attempt by lawmakers to silence citizens following historic victories, and to thwart momentum behind current citizen-led petition gathering efforts. But this is not a new fight. Corporate interests and the politicians they have influence over have tried to silence citizen-led petitions for years. Thank you for letting lawmakers know we won’t stand for them passing Anti-Voter Initiative bills limiting our voice in our democracy.